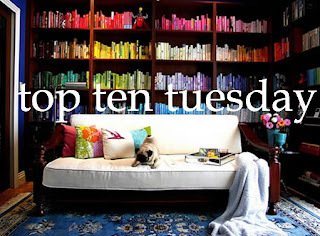 Top Ten Tuesday is, as always, brought to you by The Broke and the Bookish. This week's Top Ten is a little difficult for me. I don't re-read too many books, and those that I do tend to be on the longish end of the spectrum. I still have a list, but I decided to get some help on this post a friend, Miss Laura Cunningham, whose blog you can check out and bring some love to here. Between the two of us, I'm sure we can manage to find an unorthodox kind of light and fun. Sometimes you can’t beat the feeling you get rereading a book that you read as a child. It feels like going home. And this is that book for me. Wizards, riddles, magic, dwarves, dragons... What’s more fun than a good old-fashioned adventure story? Good Omens is my go-to comfort book. Fun, hilarious, almost heartwarming- well, as heartwarming as a book about the apocalypse can be. So good I named my cats after the two main characters. This is a book that I love to get lost in. The characters are easy to love, the central mystery is tantalizing, and the atmosphere is heady and thick like summer fog. Easy to read, not easy to put down. I highly recommend, not only this, but all of Zafon’s books. When what you’re looking for is “light and fun”, you can’t beat short stories. They give you a glimpse of a story without the commitment of a novel. Be careful, these stories are like potato chips- you’ll start by reading one and, before you know it, you’ll finish the book. I guess a recurring theme here is “things I read in childhood” and “fabulous adventures”. Oh well. This is one book that you definitely have to read in your lifetime. If you liked the movie, you’ll love it. If you didn’t like the movie... How? Also one time I met William Goldman and cried on him but he was very nice about it. Stand up fella. If you want a strong plot-line and deep, driven characters, admittedly, this isn’t for you. But if you want endless spasms of hilarity loosely stitched together by improbable situations, then it’s a perfect match. Very Monty Python-esque humor. Light and fun at its best. On this, Laura and I can agree wholeheartedly. Everyone should read it. This and The Neverending Story, though that one is a bit more of a mire. For the record, I've never cried on Mr. Goldman. This is in the short story way of things. If you like short stories about darker things but not enough to pick up John Connolly's Nocturnes, this is a good start. From the author of Jonathan Strange & Mr. Norrell. I know what you're thinking: Oh god, here comes the Austen. You're not wrong. But I've loved on Doornebos' stellar bit of fluff before. It's kind of wonderful. I think this one actually goes by the title of To Conquer Mr. Darcy now, which I think is just sad. Sweet short stories by the autor of Atonement. He tried the stories out on his young kids before publishing, so you know they've got a pretty respectable stamp of approval. Seriously. Anything. This includes but is not limited to: his syndicated column in the Miami Herald; the Starcatcher series which he wrote with Ridley Pearson; Dave Barry Slept Here; and I'll Mature When I'm Dead. You knew this was coming didn't you? Look, I know it's not a terribly light book or a terribly fun book (unless you go into it knowing you can ride the wave of Sir Walter and Elizabeth's stupidity) but this book is kind of like my reset button. I'll re-read it simply because I know every word. It's like a palate cleanser. I have two copies in my apartment right now. It's a necessity. Oh, I totally agree with your short story assessment! Perfect for when you're looking for something light to read - and Neil Gaiman is always a winner! You're right, Good Omens is so much fun! And Hitchhiker's Guide made it to my list, too. Great choices!